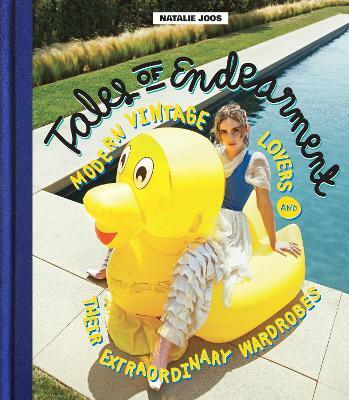 Tales of Endearment, a companion to the popular website, is a collection of photos and stories by Natalie Joos featuring today's Who's Who of vintage clothing. The men and women that buy, collect, wear and love vintage come from all walks of life but share this one impartial pass... read full description below. Tales of Endearment, a companion to the popular website, is a collection of photos and stories by Natalie Joos featuring today's Who's Who of vintage clothing. The men and women that buy, collect, wear and love vintage come from all walks of life but share this one impartial passion: each one of their tales reveals a common motivation to celebrate the past and its many inspiring fashions. From 1970s rock & roll t-shirts to Edwardian mourning jackets, mod suede skirts to one-of-a-kind accessories, every single garment in their wardrobes was handpicked with love, gratitude and a green conscience, and has the power to inspire today's, and tomorrow's, lovers of individual style. Tales of Endearment identifies the mantra that everything old becomes new again, and the interesting people who hold dear to it. They are the real deal vintage connoisseurs, historians, collectors, sellers, enthusiasts and aficionados. Joos personally chose them from her wide and far-reaching circle of friends in different parts of the international arts and entertainment world because they know how to style vintage clothes in a relevant and modern way. Traveling to photograph them at their homes, or in other inspiring locations, wearing their favorite pieces, the result is a singular collection of yesterday's colors, shapes, prints and patterns that have been repeatedly passed on to become today's trends. Born and raised in Belgium, Natalie Joos began her career in fashion when she moved to New York in 1997. Armed with a university degree in Political and Social Sciences and a major in Journalism, she first started working as Personal Assistant to writer Glenn O?Brien, followed by six years as Studio Manager for acclaimed photographer Craig McDean. Natalie eventually created her own casting company in 2003. Over the next 10 years she built up a roster of clients such as Hugo Boss, Helmut Lang, Phillip Lim, Rocawear, and has worked with photographers such as Mario Sorrenti, Paola Kudacki and Sebastian Faena. Natalie was also appointed casting agent at Hercules Magazine, and was a regular contributor to V magazine, Japanese Vogue and the Last Magazine. In 2010 Natalie launched Tales of Endearment, a blog with stories about friends, vintage, love, style and life. She takes her readers inside the homes of vintage-loving women and men and also posts her own looks to showcase a modern mix of contemporary and vintage fashion. The travel and dating sections on Tales of Endearment are also very popular. Natalie is also a favorite of the street style photographers-she?s known for her playful use of colors and patterns - and has as such become a sought-after Influencer. Gradually Natalie has made the switch from casting to styling and consulting. She contributes to magazines and has creatively directed successful shoots with Chloe, Loewe, Max Mara and Diane Von Furstenberg. In 2015 Natalie and her business partner Moa Sandquist launched Tales of Vintage, a vintage e-commerce platform. Natalie lives in Los Angeles and Tales of Endearment is her first book.